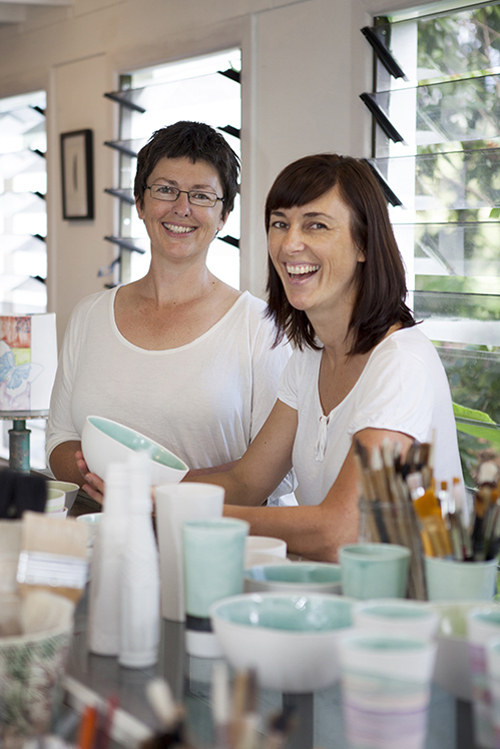 FK chats to Lisa and Linda, the lovely sister’s of ceramics label, Pebuku Pottery. We can’t wait to see Pebuku’s stunning work at the upcoming Brisbane Markets! Tell us a bit about Pebuku Pottery and what products we can expect to discover? Pebuku Pottery is the dream of two sisters who love creating and working with their hands, who believe that the everyday objects we use should be beautiful and inspiring. We are bower birds, collecting vintage objects, natural items, ephemera, we get excited about great design, texture, forms, colour and mark making. 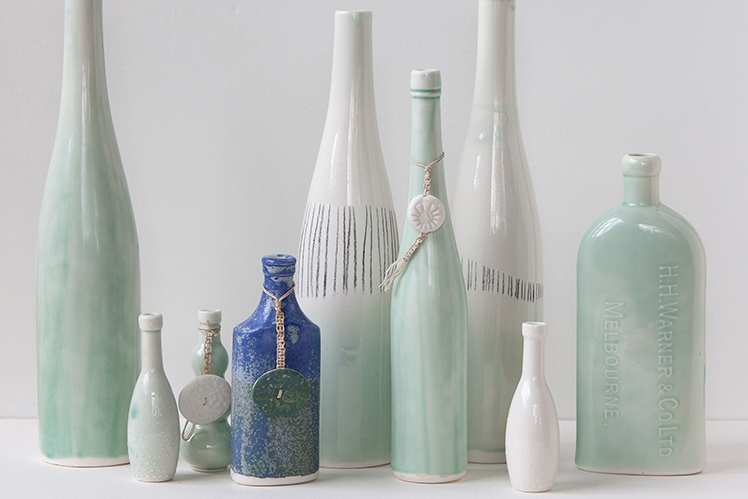 Using the finest Australian porcelain clay, we make creations that inspire us and give us joy, functional items that have a connection from us, as makers to our customers; who have killer taste and recognise the value of handmade items and the beautiful qualities that connection from artist to maker can bring to your home. Often, we start by making things we need for our own homes, or gifts for friends and family; if we like them enough, we share them with you and produce a limited run of production. Both inspired by the beauty, and tactile nature of clay we enrolled in a night class many years ago in Melbourne that taught pottery. We both went on to pursue other artistic studies, but the love of clay never left us and years later, marriages, kids, moves and all that life throws at you, found us both on the beautiful far north coast of New South Wales. This gave us the opportunity to work together on our own range of porcelain, combining our talents and strengths and pursue our long held dream of designing and creating beautiful, functional and affordable ceramic pieces. Our ceramic studio is nestled under Lisa’s cottage in Uki and our design and photography studio is at Linda’s Home in Murwillumbah, so we have the best of both worlds. We are constantly inspired by nature and the beautiful area we live in. We feel that objects created by hand connect us in ways that mass produced items cannot. We create because we want to share this joy with others by producing unique designs that are always beautiful, useful and that bring a smile to your face each and every day. 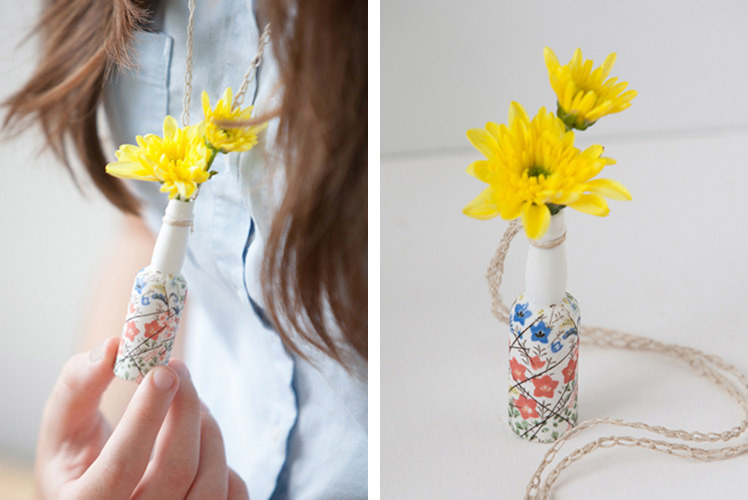 Seeing other makers creating and working hard at their business motivates us, we love to use handmade items in our own homes and always leave an artist market with a swag of gorgeous creations we could not resist from other makers. 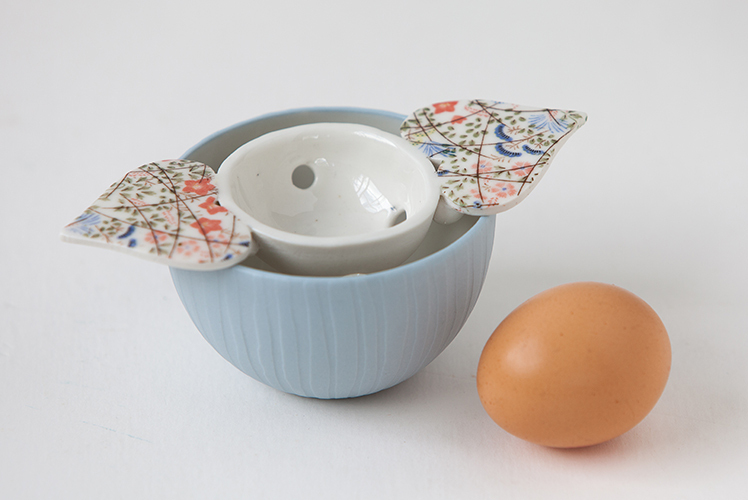 Having such a great partnership, one of the benefits of working as a team means we constantly inspire and challenge one another with new ideas about form, function and the aesthetic possibilities of working with beautiful porcelain clay. What do you love about living in Uki? Uki is a beautiful part of the world to live and work in, just sitting on the balcony looking out on the rainforest and the sky is an inspiration. The community is full of creatives, we are blessed with musicians, comedians and performers, creative artists and makers of all kinds. There is a lot of support for indie makers locally, and we all share values of sustainable, creative living and respect for each other and the environment. It is a challenge to put yourself out there as a small indie pottery label, the mass production giants are our competition. A trip to the local shopping centre can make you cry… a complete set of dinnerware can sell for $30, but there are plenty of people out there who share our passion for humanity in objects, and the exceptional qualities these objects can bring to your life. Markets like The Finders Keepers give us a chance to connect with these people and other makers. Connecting with people through our creations, that is the best part of having our own label. Having too many ideas is our biggest problem and it is difficult to refine them down to a style that defines us and Pebuku as a label. The only thing that has allowed us to get this far is learning from past experience and sometimes being ruthless about our selection of product and colour. 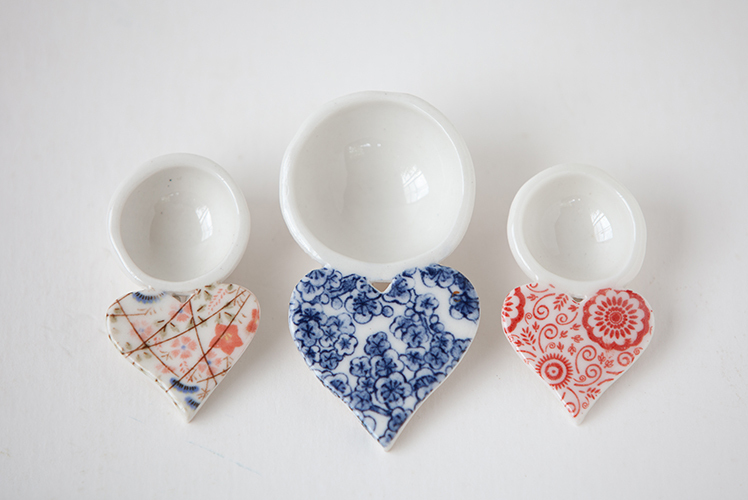 What can we expect to see from Pebuku Pottery at the upcoming Brisbane Markets? 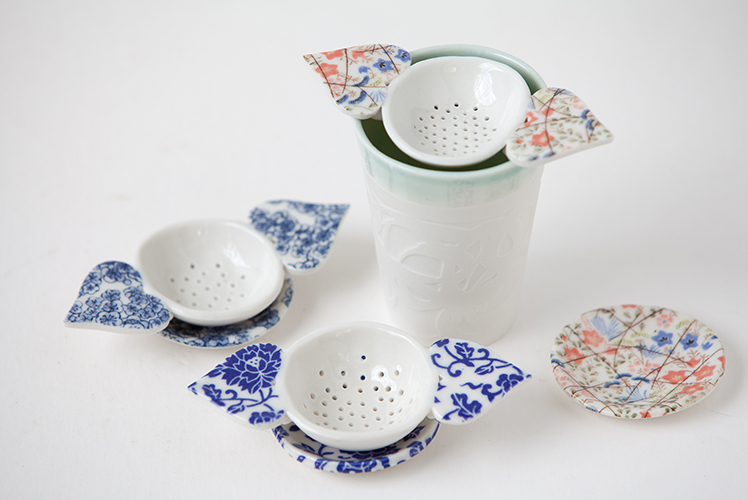 We are bringing the best of our new range to the Finders Keepers market in July. 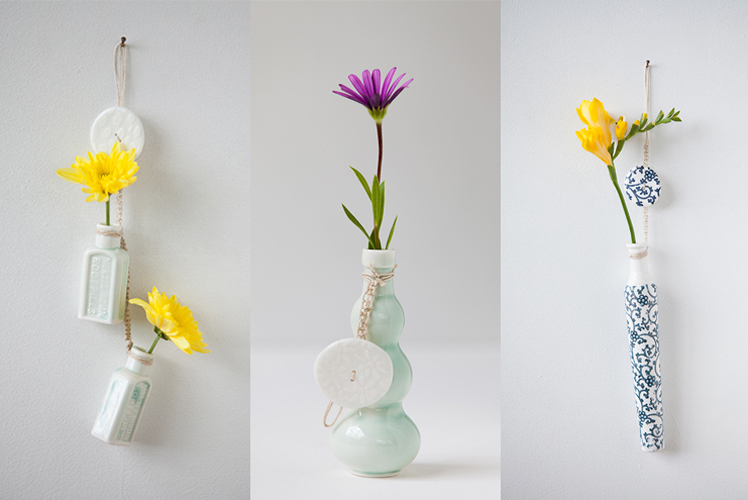 Some gorgeous hanging bud vases inspired by our vintage bottle collection are a particular favourite of ours, especially our Boho Chick bottle, small enough to wear a flower around your neck. 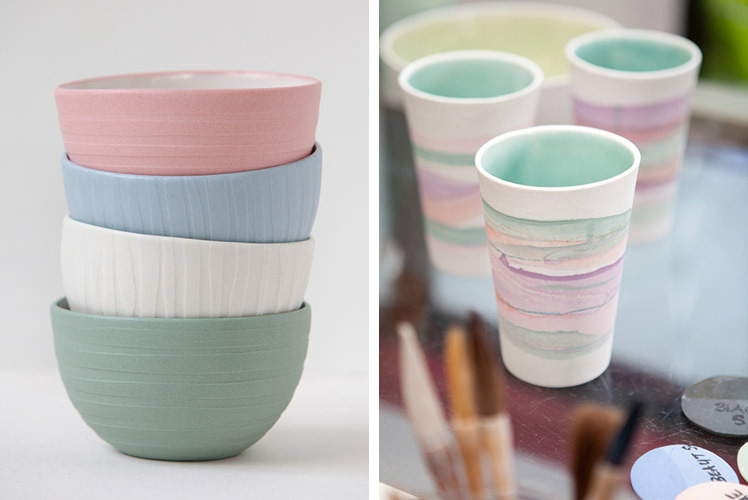 We have been creating porcelain tumblers and coffee bowls inspired by soft watercolour designs we have been painting. We are excited to be debuting some water-etched porcelain electric lighting and also some beautiful candle bowls created in conjunction with Northern Light Candle Company who make the most delicious organic bees wax candles. We can’t wait! Gorgeous pottery and inspiring, talented women!! Looking forward to seeing them in Brisbane in July!